FILE - Protesters wearing masks depicting South Korean President Park Geun-Hye (L) and Japanese Prime Minister Shinzo Abe (R) hold hands during an anti-Japanese rally in Seoul. South Korea President Park Geun-hye and Japanese Prime Minister Shinzo Abe promised to resolve the long-standing dispute over comfort women by year’s end. In Seoul Wednesday officials from Japan and South Korea held working level talks to settle the controversial historical dispute over Japan’s forced prostitution of Korean women during World War II. South Korea President Park Geun-hye and Japanese Prime Minister Shinzo Abe promised to resolve this long-standing controversy by year’s end, when they held their first bilateral summit in Seoul last week. 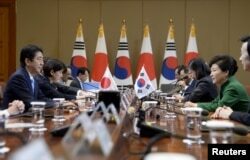 Seoul’s position entering this new round of talks remains unchanged. “As Japan is the architect of the problem, it needs to solve the problem. The Japanese government must provide solutions which victims can accept and our citizens can accept," said South Korea’s Foreign Ministry spokesman Cho June-hyuck on Tuesday. The conservative Abe who came to power in 2012 has promoted a stronger military posture for Japan and a nationalistic appeal that has at times embraced a revisionist view of history. The prime minister and some of his supporters have been accused of trying to either minimize or deny Japan’s past wartime atrocities. Regarding Asian “comfort women” forced into sexual slavery by Japan’s military during its occupation of Asia and World War II, the Japanese leader has used elusive language to express remorse without assuming national responsibility for past abuse. Some Abe supporters caused widespread outrage in Asia with claims that many “comfort women” were not coerced but willingly engaged in prostitution for financial gain. Japanese Prime Minister Shinzo Abe (L) talks with South Korean President Park Geun-Hye (R) during their meeting at the presidential house in Seoul, South Korea, November 2, 2015. When they finally held a bilateral summit last week, both agreed to prioritize finding a resolution to this issue that has strained relations between the two major U.S. allies in Asia. Tokyo’s position is that compensation for Korean individuals who suffered from Japanese colonial rule was settled under the 1965 Korea-Japan Normalization Treaty, that included $800 million in grants and loans from Tokyo to Seoul. While Prime Minister Abe maintains it is unfair to demand an apology from him and others born after the end of WWII, he has promised to uphold those made by past Japanese leaders including the 1993 Kono Statement that offered apologies and remorse to comfort women. Some in Japan have criticized Park for not clearly stating what she specifically wants Abe to say and what restitution Tokyo should make to resolve this issue. Japanese negotiators are reportedly seeking assurance that any settlement agreed to will be final and not litigated again years from now. There is also concern in Japan that any settlement with South Korea would open the door to similar demands from other Asian countries that suffered under Japanese military occupation. Instead of offering formal compensation there are reports that Japan has offered to either create or donate to a non-governmental fund to compensate the comfort women victims. Ahn Sun-mi is the director the Korean Council for the Women Drafted for Military Sexual Slavery by Japan War, a group that represents some of the surviving “comfort women” who are now in their 80s and 90s. Her group, she said, would reject any compromise proposal that would limit Japan’s acknowledgement of direct involvement and responsibility for past atrocities committed, and did not offer a direct and “sincere” apology to the victims. “If the Japanese government recognizes and accepts its responsibilities in this crime, which is also recognized by the international community as an illegal and anti-humanitarian crime, compensation must be followed as an evidence of the apology,” said Ahn Sun-mi. 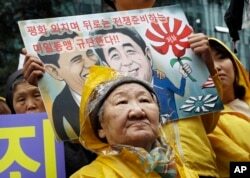 FILE - Former comfort woman Kil Un-ock who was forced to serve for the Japanese troops as a sexual slave during World War II, attends a rally against a visit by Japanese Prime Minster Shinzo Abe to the United States, in front of the Japanese Embassy in Seoul. The advocacy group director would not say how much money would satisfy their demand for compensation. In fact she said if the Japanese government gave them “all the land in Japan” it could not make up for what they suffered. Northeast Asia analyst Daniel Pinkston, a visiting research fellow at Babes-Bolyai University’s Conflict Studies Center in Romania says nationalist supporters of both Abe and Park have used historical disputes as wedge issues to translate public outrage into political support. To resolve this issue, he says, the two leaders must do the right thing based on shared democratic and human rights values and reject vocal minorities who want to keep the conflict alive. “Sometime and in some cases I think the leadership both in Japan and in South Korea need to stand up to these hyper-nationalist groups who do not represent the mainstream view on this issue,” said Pinkston. The two nations have held nine official level talks in the last two years without reaching any resolution of the "comfort women" issue. But the recent commitment made by Park and Abe to settle this dispute by the end of the year has given the negotiators a new sense of urgency. There is also speculation the Park and Abe could meet again in the coming weeks as both leaders plan to attend the G-20 summit in Turkey, the Asia-Pacific Economic Cooperation summit in the Philippines and the ASEAN security summit in Malaysia.